Ok, so it’s no secret around here that since Cooper George made his first appearance this blog has become a chore shuffled far down on the To Do list. Seriously. Laundry, dishes, housework, not to mention walking the dog, playing with Kenny (without a baby on my lap) and stringing together an at least slightly coherent sentence to Casey tend to take precedence. Then there was the move to Atlanta. The move back. Trips to California and Florida. Thanksgiving cooking. Christmas decorating, shopping, partying and entertaining. I’ve been lucky to write a few times a month, much less the near-daily posts of this blog’s first two years. What is a girl to do?? Fortunately, inspiration comes in unlikely packages. Though I have begged off the most recent slew of requests to review products and websites, when I got a note to review Katherine Center’s next book, pre-publication, I jumped on it. I reviewed her first book on this website last spring and absolutely loved it. When her newest work arrived in the mail, I let it sit unopened on my dining room table for well over a week for the simple reason that I knew that once I picked it up, I would want to read it all the way through without stopping. Last night I braved a peak inside the cover and BOOM. Here I sit 24 hours later a richer woman. I will write a real review for the book over the weekend, but suffice to say for now: it gave me the kick in the rear I needed to get back up and going on this blog. The book is all about a mother drowning in motherhood and her decision to do something to get (at least a piece of) her old self back. Ah. Sing to me, fair authoress. When Casey first set up this site for me, it was to be more than just a hobby-slash-place to post pictures for the grandparents. It was to be a creative outlet and a piece of me that was all my own. And thus, I resolve that it shall be, once again. Not a post-laundry-dishes-dusting-child-rearing afterthought. But something that is all my own. Not only that, but I’ve re-hired the cartoonist who drew the picture on the banner to update our family portrait in all it’s cartoonish and circus-worthy glory. So stay tuned for that. And now, in light of all that is just said, I feel it necessary to write at least one item about my Mommy life…. Kenny picks his nose all. the. time. It’s become a needle under my skin. Veritable water-torture. The sight. The sound. The slimy, squishy boogers that get wound around his fingers and up under his fingernails. GROSS. I’ve actually caught myself wanting to tape his nostrils shut, or at the very least putting his hand in a cast just to stop the madness. Nothing works. Threats, time-outs, hand slaps, begging, bribing… nothing. So. 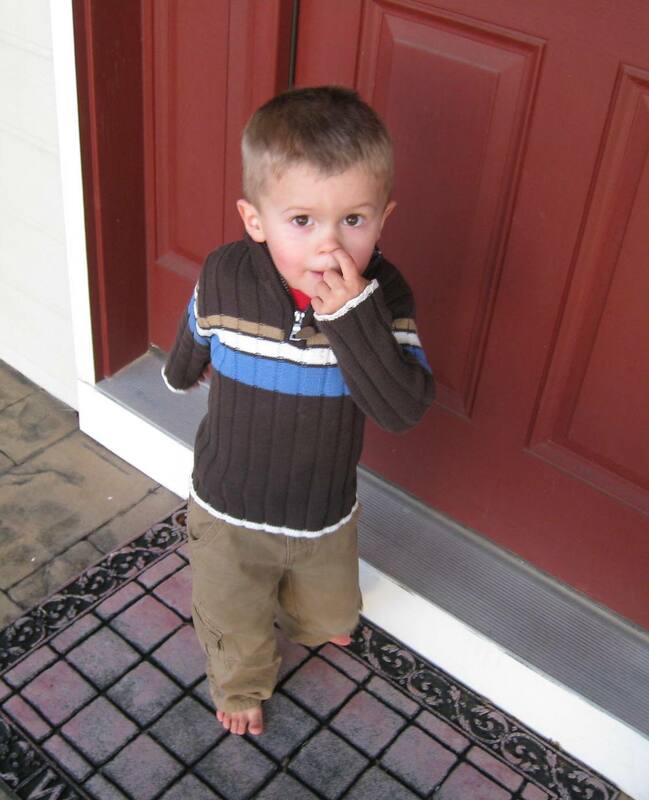 How do you get a three-year-old to stop picking his nose??? Pick it for him, that will do the trick, glad you are back! Oh dear….I’m just now at the stage where I’m trying to teach my oldest little man how to use a tissue and not the COUCH for wiping his nose when it starts dripping (due to allergies/colds)! It’s just started in the past week. (He used to tell me to “wipe it,” but has just stopped.) I’ve told him OVER and OVER not to wipe it on anybody or anything except a tissue. That it is NOT nice. I don’t know if he’s using it for an attention getter since his little brother is getting maybe slightly more attention. I don’t know. When you find the trick for yours, let me know!! I’ll probably be needing it soon. Hi Kristjana! It’s so great to see your lovely post about reading my book (and the last one, too)! I always feel so delighted when I find a book that pulls me in and along like you describe, and its such an honor to know that Everyone Is Beautiful did that for you! Thank you so much for your kind words! I can’t wait to read the review–though no pressure, of course. Many good wishes to you and your beautiful family for ‘009! !